The Scout Slim Jim gun belt and holster has border tooling and silver spots. The holster also has a US Concho which makes this gun rig stand out from the rest. Available in your choice of straight or cross draw. Color choices are Black, Brown and Natural. This Slim Jim gun rig has the California Style Slim Jim holster. 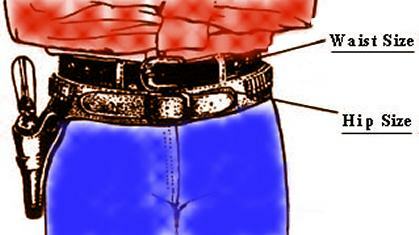 The Slim Jim Holster and Gun Belt was also known as The California. In the early days of the west guns were usually carried in a pommel or saddlebag holster. But as revolver advancement were made and they became more manageable saddle makers designed a more accessible and efficient hip holster. The first true western style holster was the "California". These were slender in profile and had a deep form-fitting body with sewn in toe plugs to keep debris out and help secure the gun. The holster was mounted on a belt by a leather loop sewn on the back. The "California" was also known as the "Slim Jim". Most of these western holsters were embellished. Designs went from plain to heavy complex carving or stamping. The "California" was replaced in the 1870's with the advent of the cartridge for hand guns. Click here to read more about the History of Gun Leather and Slim Jim Gun Rigs. Cochise Leather Company is proud of the quality, durability and value that it gives in all of it's leather goods which are hand cut and made by David LaFlair in his Cochise, AZ leather shop. We're located just 25 miles east of the infamous old west town of Tombstone, Arizona.